“Hey, hey, hey, hey…hey stoopid!” Why do I keep singing that line to myself when people are within hearing distance? Shouldn’t a 30-something guy like myself have grown out of such juvenile practices? No friggin’ way. 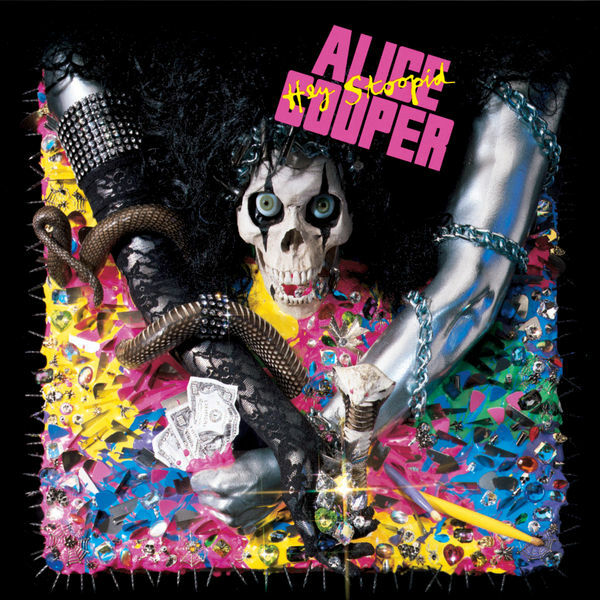 Alice Cooper is still my hero, even though he hasn’t put out a truly great album since Muscle of Love. Nobody can sing the word “hey” quite like him. He’s a true artist when it comes to singing “hey”. And judging from the impressive array of rockers who lined up to help the Coop out on Hey Stoopid, his reputation as a singer of “hey” hasn’t dwindled much in recent years. His battery of stringbenders alone—Joe Satriani, Steve Vai, Vinnie Moore, Slash—is enough to make guitar freaks freak. Along with a killer core band that includes studio ace Mickey Currey on drums and Vancouver’s own John Webster on keys, Cooper carries on in the mainstream hard-rock tradition begun a couple of years ago with Trash, but without losing the nasty lyrical edge he’s famous for. Cooper might look like death warmed up, but, musically, the 43-year-old is alive and kickin’. If he keeps this pace up, he may still reclaim the hard-rock crown he wore so well in the ’70s. I, for one, would love to see it.